Old Fort Niagara, gorgeous views and full of history! No, this isn’t day two. This is the second part of the first full day we were in Niagara. 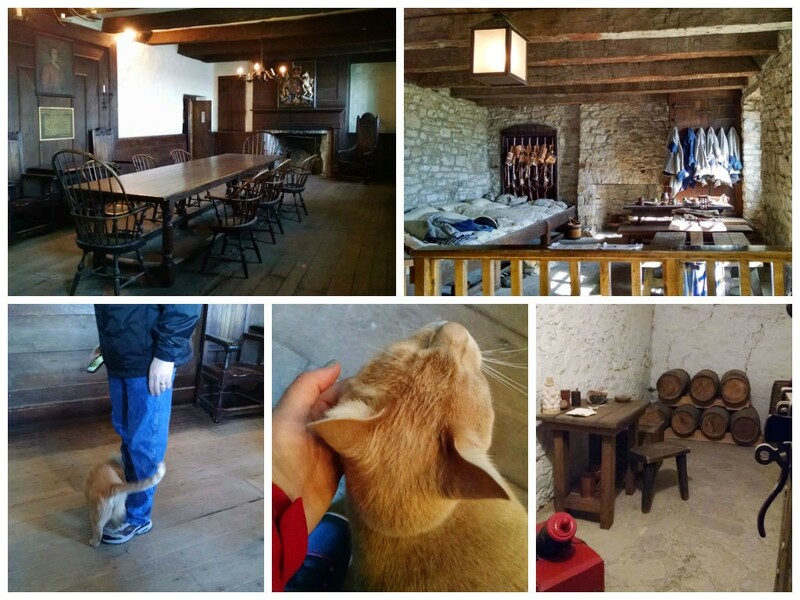 We headed to the Old Fort Niagara, which has a rich history! It also plays a pivotal part in U.S., British, and French history. Being a pivotal piece of property at the mouth of the Atlantic that is fed by the Great Lakes and their connecting straights, Fort Niagara changed hands a few times between the three countries. I won’t bore you with all the details. You can read them here. One of the oldest surviving 15 star and 15 stripe flag can be seen in the visitors center. It is an original “garrison color” flag from the War of 1812. It flew at Fort Niagara, was captured and given to “Prince Regent” who would become King George IV. Then it was given to the Sir Gordon Drummond of Scotland. His family and descendants cared for the flag until it was returned to the fort in 1994. It is amazing piece of history. Not easy to photograph due to it’s protective enclosure, but definitely worth the trip to see an amazing piece of history. It was a bright, gorgeous day!! We wandered around the park, reading, photographing, chatting about what we saw. Climbing to the top and working on our way down several of the buildings. The view is definitely worth the climb! We even watched the little video about the fort. I found it interesting that the French tricked the native Iroquois nation into allowing them to build a “house of peace” build like a stone fortress and could withstand a regular attack. It was deemed as a trading place and had many of the elements of a trading post, but had a garrison with quarters and storerooms. The view is gorgeous! The river feeds into Lake Ontario; one of the five Great Lakes. While it has the smallest surface area, it has a larger volume than some of the other Great Lakes. It is also the ONLY great lake not to share a shore with Michigan. There are some of those viewers you can use to see across the lake to where York was which is now the city of Toronto. Being across a body of water, these two were at odds with each other during the many wars that the fort has participated in. So, while we were walking through the French Castle, we were made a friend. Out of nowhere, this orange tabby cat appears and just starts walking around our feet and rubbing on our legs. So, of course I had to stop and pet the kitty! It was so friendly and followed us a little bit. It was just too cute! S and I were just amazed at how short the beds were for the “troops” to sleep in! And they were mostly just one long feather bed type sleeping arrangement for them all to sleep in. I can’t imagine sleeping with a group of people like that. I mean, just look at that center picture? Would you sleep there with your closest 8 or 10 fellow soldiers? Yeah. I didn’t think so! Of course, there were two gardens with fresh herbs and vegetables growing. I tried to identify many of the items growing there. I think there were maybe one or two that I couldn’t name. Not too bad for a Kitchen Hoor, huh? There was chard and kale, some onions and probably garlic, leeks, rosemary and thyme. All hearty crops for that time of year. Just look at that gorgeous view of the lake!! I don’t think we could have asked for a more perfect day to celebrate one year together! These last shots are, I think, the artillery encasement in the mounds. They were pretty photographic, but it was pretty dark down there. I tried to get a shot through one of the cannon slits of the view, but it didn’t work as well as the one of the lake in a previous collage. If you’re in the area, I highly suggest wandering around the Old Fort Niagara. It’s full of history and amazing views of the lake. Check out their calendar of events and make sure to visit during one of their many living history activities. If you’re there any time between Memorial Day and Labor Day you can have lunch in their Log Cabin. What an interesting and beautiful place! Thanks for sharing! I love the warmth and color of that interior brick. Thank you for stopping by and reading it! The brick looked warm, but was very cool. What a fun place! I love going to places like this. Aww, you guys found a cute kitty! We did. She followed us for a bit then headed to the office. I assumed it was lunch time.